Most famous trek in the world. Starts and ends in Kathmandu. Stunning scenery and a life changing experience. Everest. The most famous mountain in the world. 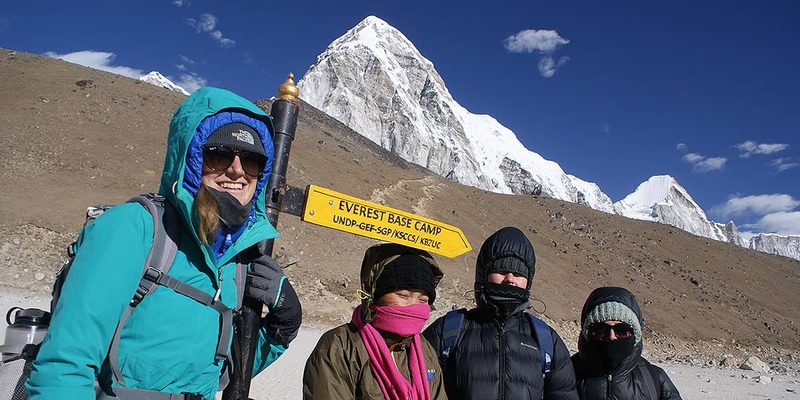 Our 14-day Everest Base Camp trek begins and ends in Kathmandu, taking in some of the most stunning mountain scenery in the world. Highlights include taking an exhilarating flight into Lukla airport, the trek itself with our experienced guides and the most famous base camp in the world. This is an epic trek and the tour price includes all meals, accommodation, domestic transport, welcome and farewell dinners. Scratch this one off your bucket list! Departing weekly. Book this amazing, life changing experience for travel in December 2018, January and February 2019 for just $2,050AUS all inclusive. 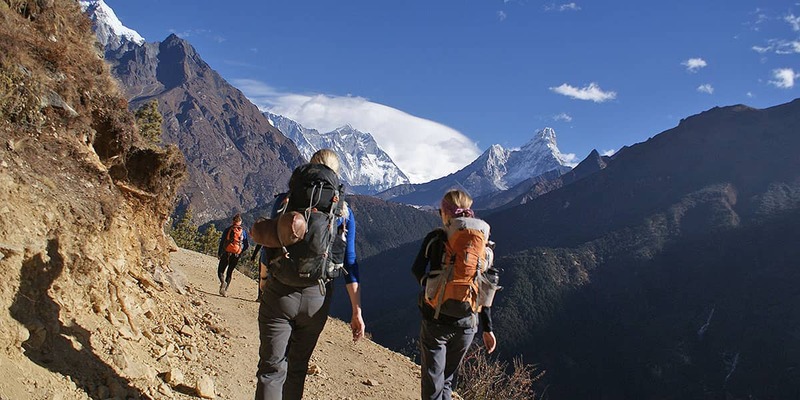 It’s winter in Nepal and a great time for trekking, with bright clear days and simply amazing views. The days are warm and sunny, with occasional snowfalls overnight at higher elevations. There’s less trekkers at this time, so book this great value trip today to escape the crowds and the summer. Please note: the discounted price will be manually added at time of booking. Please contact us to discuss this great deal! You’ll be greeted with a warm Nepalese welcome at the Kathmandu Airport (KTM) by a local Take on Nepal member who will bring you to our hotel in the heart of the city. In the evening, we’ll gather for a traditional Nepalese welcome dinner where we’ll meet one another and get briefed on the magnificent trek that lies before us! Early in the morning you’ll take an exhilarating flight to Lukla airport, this flight will provide you with awe inspiring views of the terraced landscape and river valleys below, also of the Himalayan peaks which will become your constant companions over the coming days. After you arrive, your trek begins straight away with a lovely, gentle walk to Phakding. Words cannot describe the feeling you will have when you are there, be prepared to be overwhelmed! Today the real trekking begins as you walk through stunning forests filled with rhododendron, you will also be waking alongside a river named in Nepali as the “milky river” due to its milky colour from the flow of melting of the ice. A highlight of your day will be crossing the famous “yak bridge”, the highest suspension bridge in the world, this is an experience to remember! The days trek ends at Namche Bazaar, Namche Bazaar is incredible, a trading town, the hub of the Everest region right there in the foothills of Mount Everest. It’s like something out of a movie! Today is all about acclimatizing! After breakfast, we’ll take a short but relatively steep hike up to the Everest View Hotel for a well earned cup of tea, the Everest View Hotel made it to the Guinness Book of Records for being the highest hotel in the world! 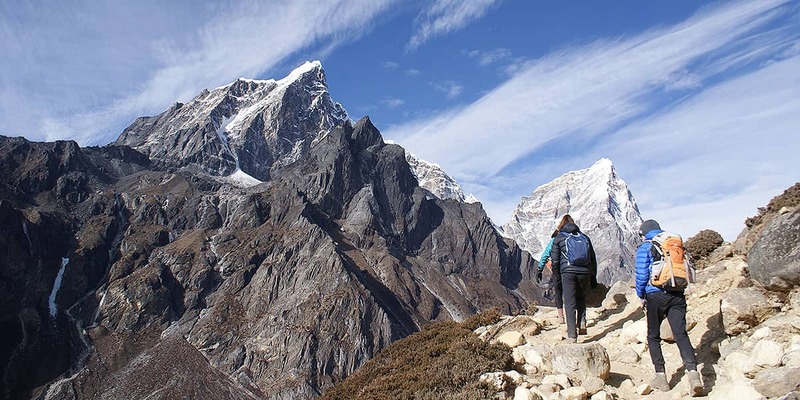 On a clear day you will have spectacular views of Ama Dablam or Mother’s Necklace, and the mighty Mount Everest! 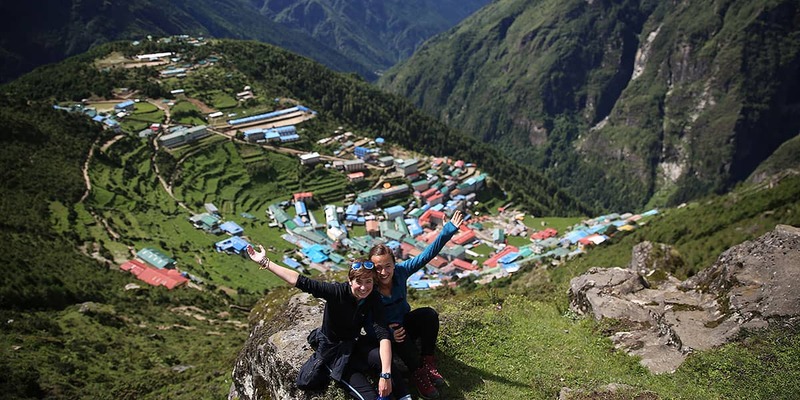 You’ll have the rest of afternoon free to enjoy the beauty of the traditional mountain village of Namche and the hospitality of the local Sherpa people! Today is a special day as you’ll veer off the beaten track and away from the hustle and bustle of the trails as we make our way to the beautiful, traditional village of Phortse. 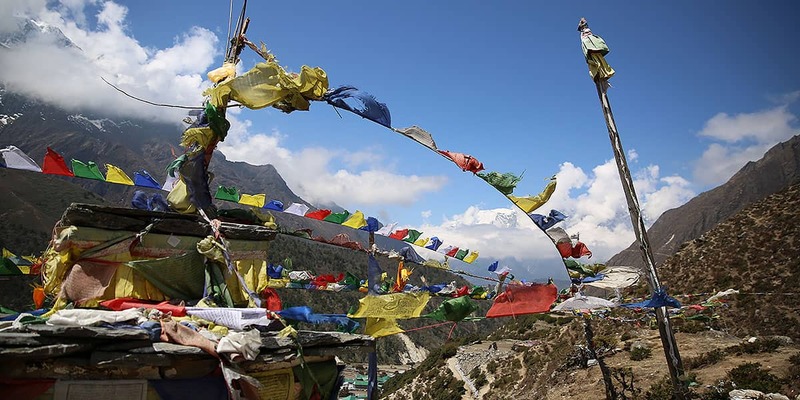 On your way to Phortse you will walk through pine forests, past stupas, and give us breathtaking views of some of the Himalaya’s highest peaks. In Phorste you can learn about the lives of the Sherpa people, many Everest summiteers live in Phortse and it is also home to the oldest monastery in the Khumbu region and to the remains of a yeti. 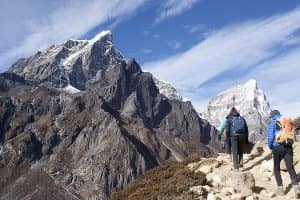 Today you will notice the landscape change dramatically around us as we trek through mossy forests, cross the Imja River, past more intricate Buddhist Mani stones, and climb upwards to Dingboche. You will feel so close to the Himalayas here with Ama Dablam looking down upon you as you trekThis is around the time in our journey where you might begin to feel the effects of the altitude but that’s normal and our guides will be looking out for you, making sure that you are staying hydrated. Today we’ll help up our bodies further acclimatize to the altitude by hiking high and sleeping low – an important part of being a safe and smart trekker! 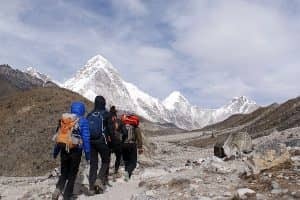 We’ll walk up the mountain ridge that towers over Dingboche with the option of continuing your upward ascent to climb a small peak, taking breaks along the way at stupas with a view, before descending back into Dingboche for a relaxing afternoon. After breakfast, we’ll continue our ascent towards the world’s highest glacier, Khumbu, and the village of Lobuche. It’s a difficult day as you will be ascending and feeling the altitude. 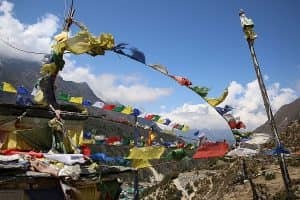 A memorable part of your day will be the our stop at Khagan Chorten, a beautiful cemetery and spiritual Buddhist site that remembers those who have lost their lives on Everest. Today it is important to walk slow, take plenty of rests and drink a lot of water. We’ll start the day heading upwards with a challenging ascent to the village of Gorak Shep for lunch and breathtaking views of the magnificent Mount Pumori. 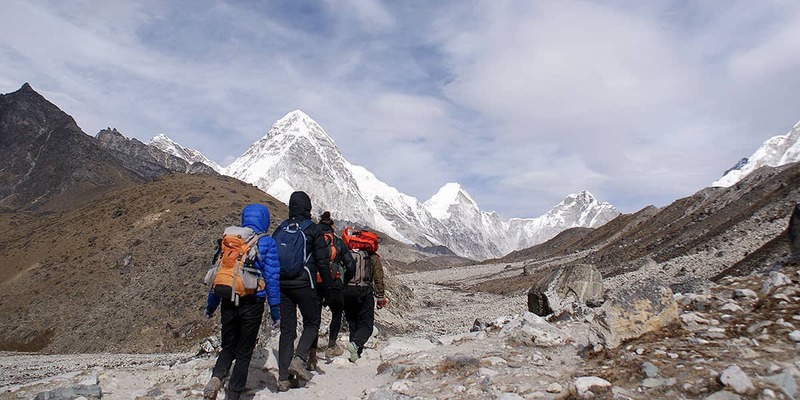 After lunch, we’ll walk along the famous Khumbu Glacier to Everest Base Camp (5380m), where climbers spend over a month acclimatizing and preparing for their summit attempt of the one and only Mount Everest! From Base Camp, we’ll enjoy a breathtaking view of the Khumbu Icefall, the seasonal tent village that is Base Camp before descending back down to Gorak Shep for the evening. It was be diffiicult for you to sleep tonight but things will become easier tomorrow as we head down. The high altitude and cold temperatures make this early morning one of the toughest parts of our trek but this mornings trek really is worth getting up for! We’ll trek up to the highest point of our journey, Kala Pathar (5555m), for stunning, unobstructed, 360 views of the highest Himalayan peaks in the morning light. Afterwards you will return for breakfast in Gorak Shep before beginning the decent through the valley, past yaks and rivers to the village of Pheriche. Pheriche is home to the medical medical post used by the Himalayan peak climbers. 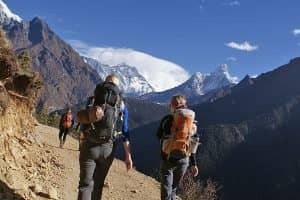 Today we’ll start our big day of trekking early, compared to what you have been though the day will feel relatively easy as you descend all the way down to Namche to Deboche. It’s interesting to be getting the reverse views of trails we took from Lukla days ago, many people find it more enjoyable as you don’t have to contend with the uphill and adjustment to altitude. You’ll find that even on day 10 of our trek, you’ll never tire of the surroundings, and will still be awestruck and surprised by the beauty that is the Himalayas! It’s a relatively easy day today which means that you can enjoy explore the village of Namche before we set off on the trail to Phakding. We’ll arrive early enough which will allow you the afternoon free to relax, do some shopping in the village, or grab a beer a well deserved beer at your lodge or in the village! It’s time to relax and unwind now as you have only 1 short day of trekking left! Today we’ll continue making our way up and down to Lukla for our final night (tear) in the Everest region. In the evening we’ll have our celebratory dinner to reflect and toast to the incredible experience and achievements we shared with your Take on Nepal team and your group members! This morning, weather permitting, we’ll take our return flight from Lukla back to Kathmandu. It’s likely that you will be departing the region with mixed feelings, sadness to leave the mountains and your team but also excitement because of all that you have achieved. Once we’re back in Kathmandu, you’ll be able to use the rest of your time to shop, have a massage, eat cake and momos before you depart for home or continue on your journey! NOTE: Flight delays between Lukla to Kathmandu due to weather conditions are quite common and a real possibility. To be on the safe side, we highly recommend booking your departure flight in the late evening of day 15 or the morning of day 16. 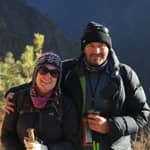 I spent two weeks with Take on Nepal on my trek to Everest Base Camp this past April. Having an overwhelming amount of outfitters to choose from, I could not have been happier with my time with this team. Their mission is inspiring, their team experienced and knowledgeable, and their energy is heart warming. I loved learning about their work with the girls in their home village of Batase, and their efforts in empowering these young women and training them to become guides on the mountain – roles that are filled by predominantly men. These young women and their stories were beyond inspirational, and their enthusiasm to learn and succeed rubbed off. 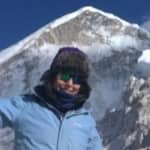 The experience that the trip leaders and guides have had in the mountains made me feel very safe – especially after seeing some of the medical emergencies on the mountain that could have been avoided with proper attention from guides. Lastly, the trek through the himalayas was life changing, but what made the experience all the more unforgettable was the Take on Nepal Team. By the end they felt like family and I miss them always. I love you all and I can’t wait to see you soon!! 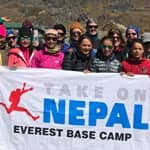 We have just returned from an Everest Base Camp trek with Take on Nepal. What an amazing adventure with amazing people. Take on Nepal is committed to providing opportunities for the women of Batase Village by educating them and training them to become guides and porters. 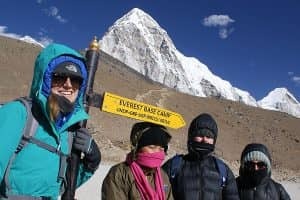 We had a life changing experience and would recommend this company for all Nepalise experiences. 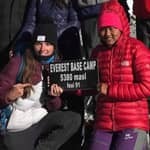 I just finished a two month trip in Nepal volunteering and trekking with Take on Nepal. The company is amazing and I would highly recommend! My experience in Batase village was unforgettable, I had the opportunity to teach in the school and visit the hostel every night to hang out with the kids. Everyone is so lovely and welcoming, I never felt uncomfortable and was very well fed by the village cook! Trekking after my time in the village was awesome as I had already gotten to know the team and felt very well supported by the guides. They were so patient with us and cracked jokes to make the long and difficult days so much better! We all became so close and it made the whole experience so much more special and rewarding! Trekking to Everest Base Camp has been my dream for many years and I have absolutely no regrets in my choice to trek with Take On Nepal. Not only were the staff experienced, knowledgable and professional, but they were also caring and supportive. I saw many other large trekking groups with only one guide, meaning less attention was given to each client’s needs. We, on the other hand, had enough staff with us to ensure that everyone felt looked after at all times, no one had to walk alone if they were far behind or in front, and measures were taken if people got sick to ensure them recovery and a successful completion of the trek. 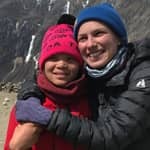 It was a truly amazing, once in a life time journey and I know it would not have been so positive if I had gone with anyone other than Take On Nepal.